Deep retrofit, rear extension and attic conversion of a Victorian house on the vibrant and upcoming Myddleton Road, now a family home. The shopfront was rebuilt and signage restored and the shop is now used as a community resource for yoga classes, toddler groups and even as a polling station. 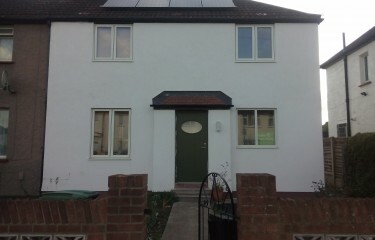 The design was modelled using Passivhaus DesignPH software, to achieve Enerphit performance. The new rear extension built in lightweight timber frame construction with an outer skin of rendered wood fibre insulation. All windows have been replaced with high performance triple glazed units, including the traditional sashes to the street elevation. 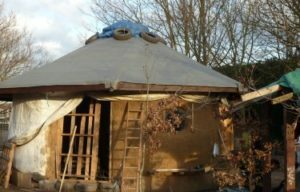 Natural ventilation also deeply integrated into the design with manually opening windows and rooflights providing excellent through ventilation when required. A green roof to to the extension (yet to be planted) will slow run-off of rain, provide an attractive view and biodiversity. 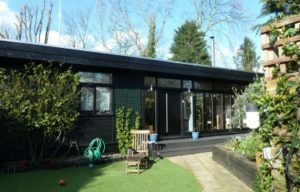 This is an energy-efficient refurbishment of an unusual single-storey timber-framed detached house. It is double-glazed throughout and has good floor and roof insulation plus internal wall insulation. The only source of space heating is a wood-burning stove. Appliances and lighting are low-energy, while there is also an air-source heat pump. 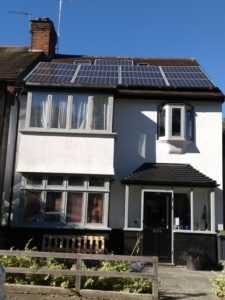 Solar PV panels are installed on the roof.